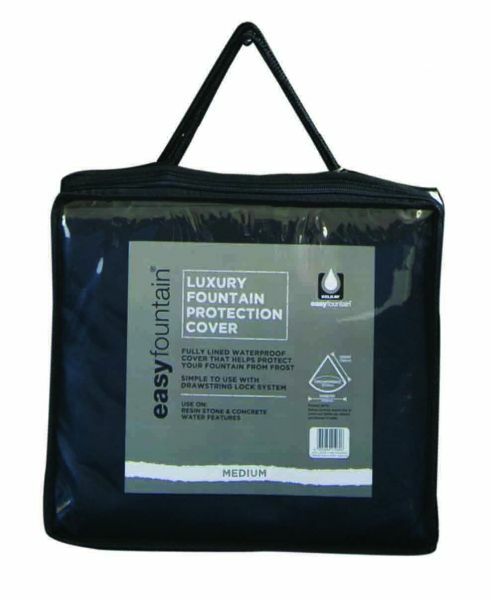 This medium sized lined fountain cover provides premium protection against mother-nature. Lined for extra durability and thermal protection the Luxury Protection Cover goes the extra mile to protect the fountain it shrouds. Designed in a cone shape it will shrug off snow, rain, plant and leaf debris. Its draw string makes it easy to secure and prevents it from blowing away in high winds. Its opaque material blocks out sunlight and limits algae growth, making the superior cover perfect for summer protection as well as winter. The Luxury Protection Cover provides ample security against the elements. Medium Fountain Luxury Protection Cover Dimensions: H1780mm (70") x ∅1370mm (54") x C4310mm (170").